The Underwater Vision and Hotel Trudy is ideally situated directly on the Bay of Utila, allowing all guests immediate access from their hotel rooms to the sea. The incredible sunset views never fail to inspire and impress each and every evening! 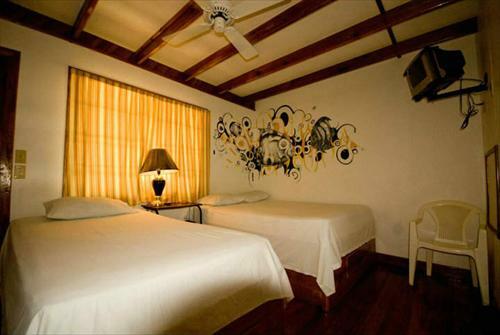 We offer FREE ACCOMMODATION in our dorm rooms for those taking PADI certification courses. Underwater Vision features three waterfront hotels, catering to both budget travellers and those looking for a little bit more. 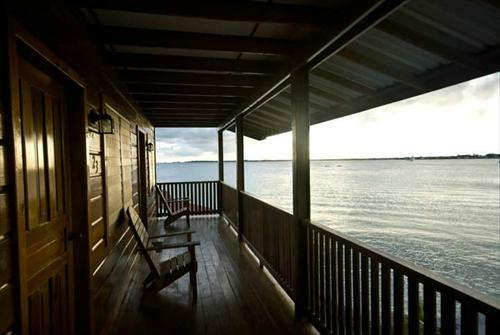 All rooms include access to the following: daily maid service, a shared kitchen, private waterfront beach area, beach volleyball court, hammocks, dock with sundeck, and spectacular sunsets. Hotel Trudy's has rooms for both shoe-string budget travelers and those looking for a few more of the comforts from home.The lower level features typical dormitory-style rooms: four beds, lockers, a fan, and a shared bathroom with hot water. The upper level provides private rooms with either one double bed or two single beds, air conditioning, private bathroom with hot water, and the best view of the harbor in town. We also offer private suites with a few more comforts available.